History of the Department to include major fires and apparatus purchases. 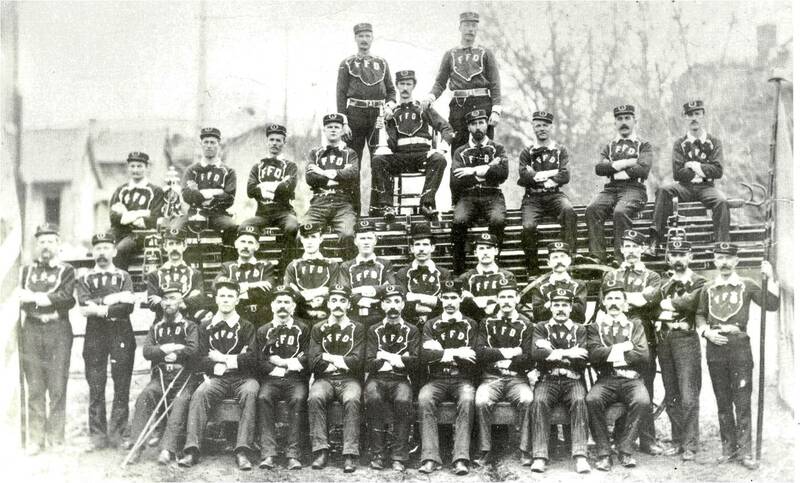 October 1875 – Following the conflagration of September 5th, a fire department is somewhat organized, however details are very limited as to the structure of this group. 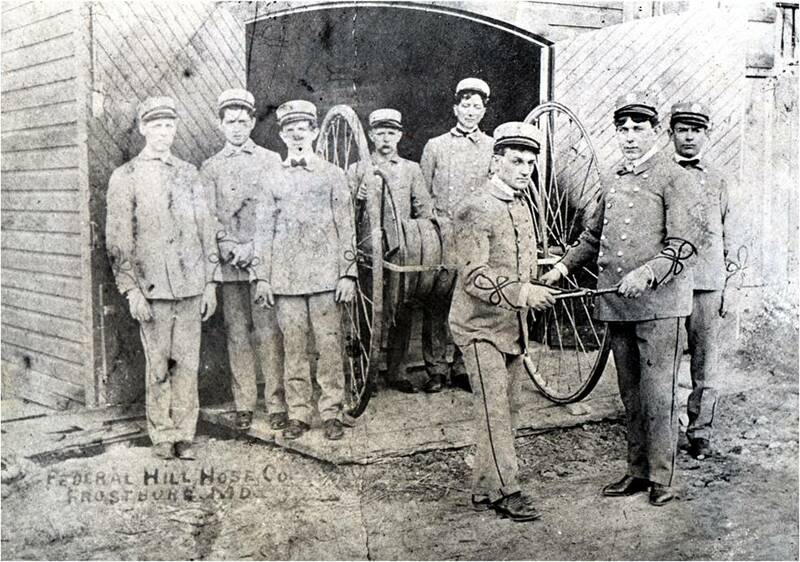 March 18, 1878 – The Frostburg Fire Department No. 1 is formed. 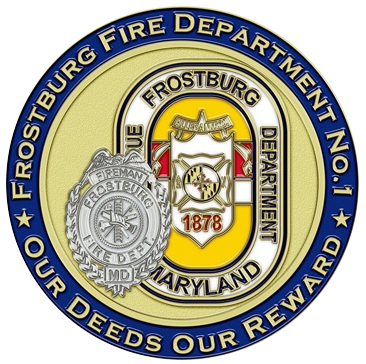 December 9, 1878 – Charter granted to the Frostburg Fire Department. 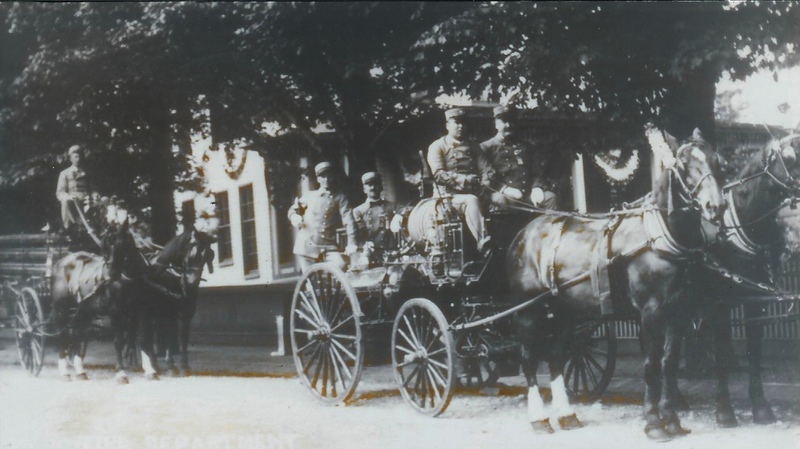 1887 – A 1,000 pound, solid brass bell, manufactured by the McShane Bell Foundry is delivered to the FFD. 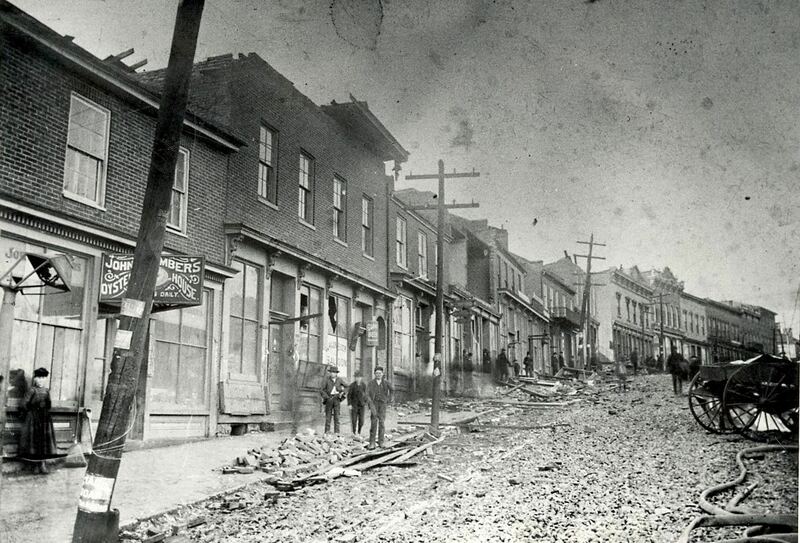 November 23, 1891 – A cyclone hits Frostburg, which cost an estimated $35,325 in damages. Several fires break out on Union (Main) street. 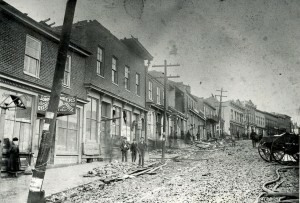 Those who try to fight the fires are at a disadvantage, for Union Street is piled high with debris and impassable. 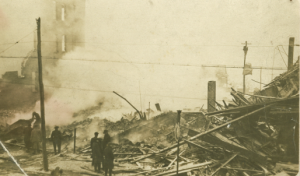 April 4, 1893 – Frostburg firemen are called to assist the Cumberland FD in what is remembered as “the Baltimore Street” fire. 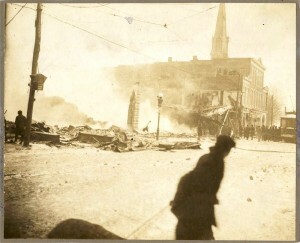 This fire, of which the cause never became known, started in a frame warehouse that stood in an alley which ran from Mechanic to Liberty Street, just behind the buildings on Baltimore Street. This fire destroyed nearly an entire block on Baltimore Street and some establishments on Mechanic Street. By 11:30am, the fire departments from Frostburg, Bedford, PA Piedmont, WV and Martinsburg, WV arrived to assist. 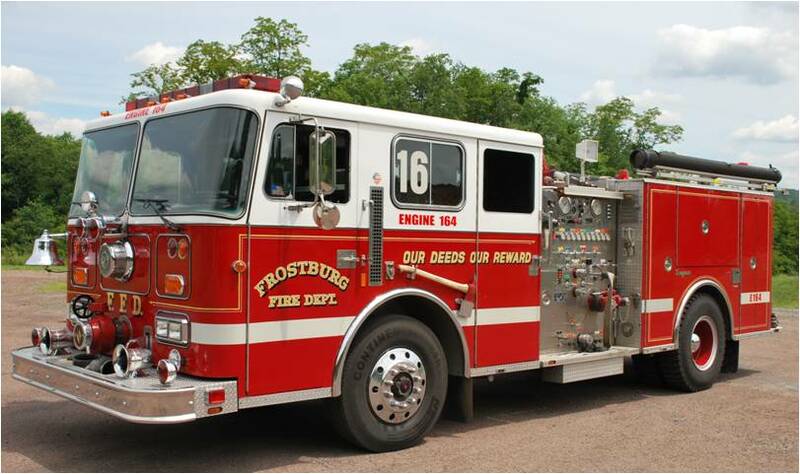 June 1893 – Frostburg is one of twelve fire companies (FFD, First Hagerstown Hose Co. – Hagerstown, Independent Junior Fire Comapany – Hagerstown, Western Enterprise Fire Company – Hagerstown, Pioneer Hook & Ladder Company – Hagerstown, Independent Hose Company No. 1 – Frederick, Junior Fire Company No 2. – Frederick, United Steam Fire Engine Company No. 3 – Frederick, Union Bridge Fire Company, Union Bridge, Westminster Engine & Hose Company No. 1 – Westminster, Veteran’s Volunteer Firemen’s Association – Baltimore and Water Witch Fire Company – Port Deposit) that organize the Maryland State Firemen’s Association in Frederick, MD. At this first state convention, one of Frostburg’s hose reels is used as the official piece for the reel pulling contest because for many years, Frostburg is known throughout Maryland, Pennsylvania, and West Virginia as the champions in hose reel pulling contests. 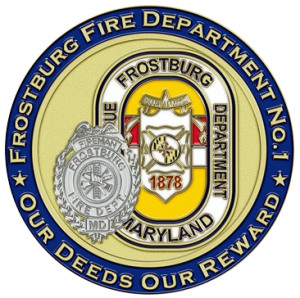 Editor’s Note: As of 2015, the Frostburg Fire Department has attended, by member or delegation, every Maryland State Firemen’s Convention since it was organized. The FFD also hosted the annual convention five times; 3rd Annual-1895, 16th Annual-1908, 30th Annual-1922, 40th Annual-1922 and 55th Annual-1947. 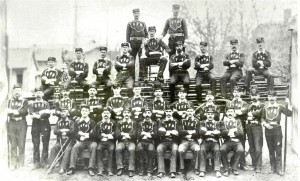 June 1895 – The Frostburg Fire Department serves as host for the 3rd Annual Maryland State Firemen’s Association convention. Moat’s Opera House is used for conducting the business meetings. 1895 – The FFD approaches the Mayor & Council about constructing two new hose reel houses at each end of town to better protect the citizens. 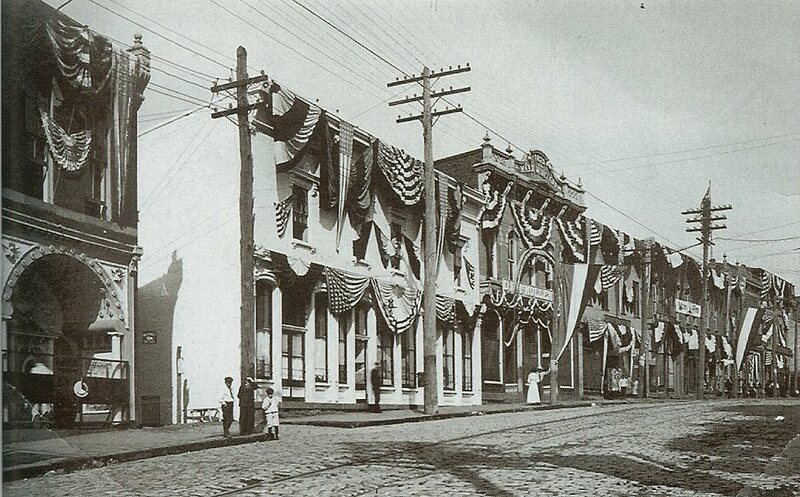 Approval is granted and houses are built on Federal Hill at Mechanic Street and on Bowery Street at Oak Street. December 26, 1899 – Frostburg Fire Department Constitution and By-Laws are adopted. 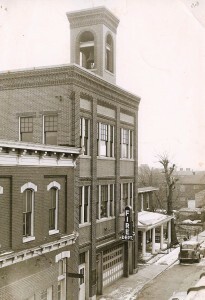 1903 – The FFD celebrates its 25th anniversary with a Silver Jubilee event, which is held at Ravenscroft’s Opera House on east Main Street. 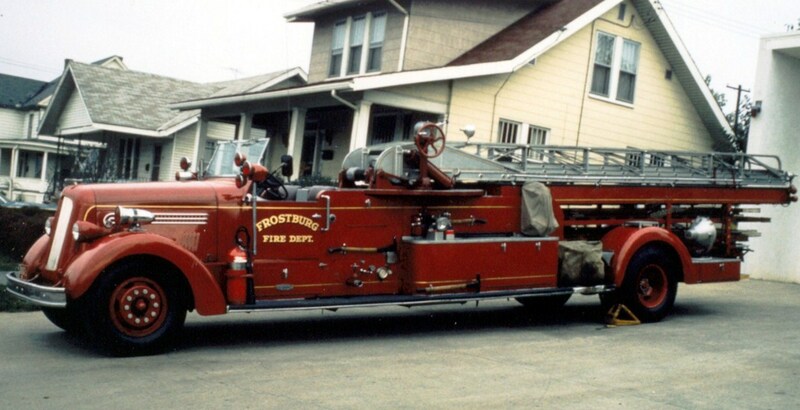 1903 – The City of Frostburg buys the Department a modern American LaFrance horse-drawn hook and ladder truck at the cost of $650. 1907 – The City of Frostburg buys the Department a horse-drawn chemical engine at the cost of $1,180. J une 1908 – The Frostburg Fire Department serves as host for the 16th Annual Maryland State Firemen’s Convention. 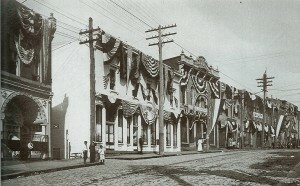 According to the Frostburg Mining Journal every house and business place in Frostburg was decorated in red, white and blue, and was the largest State Convention to date. 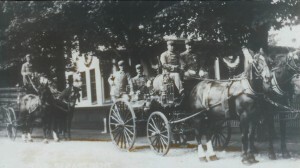 1909 – Walter W. Wittig (right) serves as Treasurer of the Maryland State Firemen’s Association for three consecutive years. 1911 – An additional hose reel house is built. Frostburg now has four “Hose Houses” located at Federal Hill & West Mechanic Street, Central Headquarters on Water Street, Bowery Street at Oak Street and Grant Street. The equipment included four hand or horse drawn hose reels, two horse-drawn ladder trucks and a horse drawn chemical engine along with 3000 feet of hose. September 12, 1912 – The Frostburg Fire Department, along with seven other area fire companies (Cumberland Hose Co., Mt. Savage, Chapel Hill, Midland, Potomac #2, Goodwill and Tri-Towns) organize the Allegany County Volunteer Firemen’s Association. The first convention of the newly formed association is held in Frostburg with all eight of the Charter organizations attending. 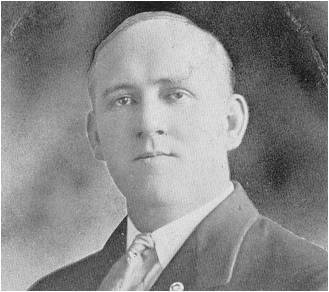 1913 – E. B. Prichard serves as the President of the Allegany County Volunteer Firemen’s Association. 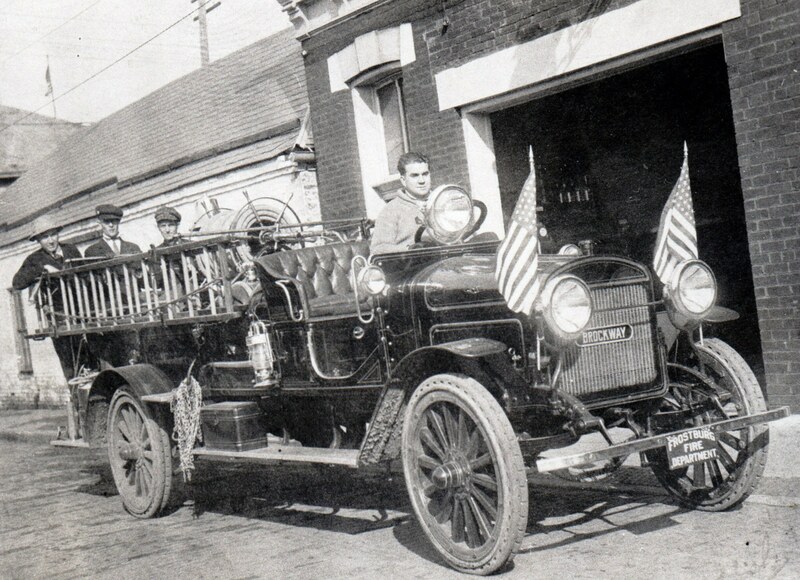 November 18, 1916 – The FFD accepts a bid for its first motorized piece of fire apparatus. The Department places an order with the American LaFrance Fire Truck Co. of Elmira, NY, for a combination engine and hose motor car, which costs $3,700. The auto truck, which was known as the “Brockway Type D” is delivered to Frostburg on February 1, 1917. December 14, 1917 – Beginning the night of December 13th, but not discovered until the early morning of the 14th, the Shea Building and other Main Street business buildings are destroyed by fire, originating from an over-heated furnace. Losses are between $150,000 and $200,000. The Shea Building was a handsome three-story brick and brown stone structure, occupying the present site of the Prichard building. 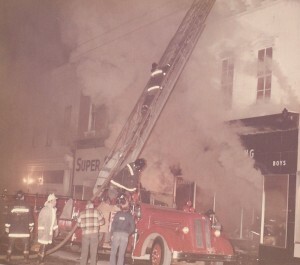 High winds drove the fire east across the alley to the building owned by the Frostburg Furniture and Undertaking, present site of Frostburg Books, then to the Betz building, occupied by the Betz Grocery, Jeffries Jewelry store and the Zeller’s Barber shop, all of which are completely destroyed. The then, newly remodeled Lyric Building, which adjoined the Betz Building on the east, is occupied by Hosken and Gunter, the Louis Stanton Hardware Store, Youngerman’s Café, the Lyric Theatre and apartments on the second floor. All of these are badly damaged by fire, smoke and water. The winds shifted, and the fire began heading west, destroying everything as far as the Gladstone Hotel, the present site of the Hotel Gunter. Hotel guest carry water in buckets to the firemen and play a major role in saving the hotel. The efforts of the FFD and firemen and equipment from Cumberland, Lonaconing and Midland, finally bring the fire under control at about 8:00am. December 17, 1917 – The Mayor and Council of Frostburg meet in a special session at City Hall to discuss the December 14th disastrous fire. 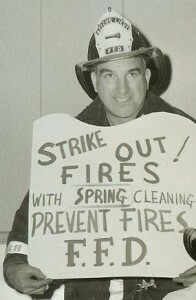 The Mayor appoints a committee to “inspect and have removed all rubbish or anything that might be liable to cause fires or endanger lives or property.” Also during the meeting, it is approved that the Department purchase 1,000 feet of additional hose and that four stoves be purchased, one for each Hose Reel House. 1918 – Joseph Crowe serves as the President of the Allegany County Volunteer Firemen’s Association. 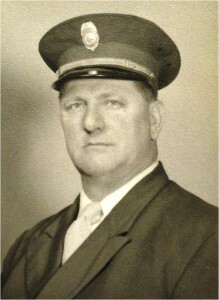 1921 – Adolph C. Frey serves as Treasure of the Maryland State Firemen’s Association. 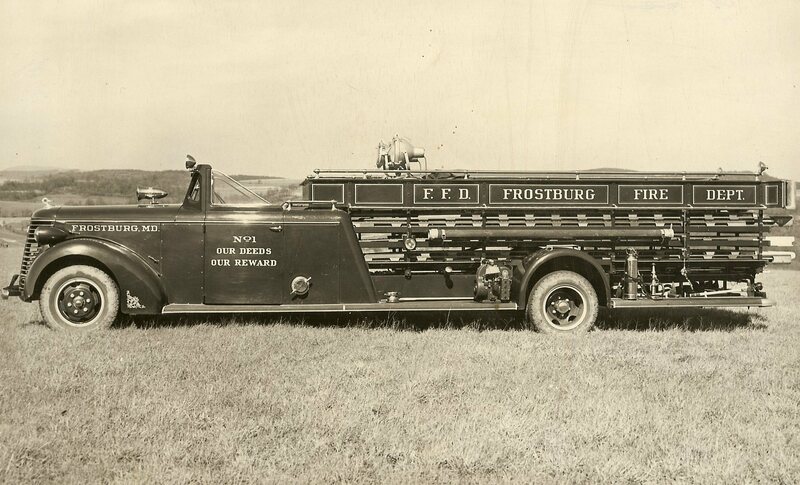 April 1922 – Frostburg Fire Protection Bonds – The General Assembly of Maryland empowers the Mayor and Council of Frostburg to issue bonds in the denomination of $500 to the extent of $10,000 for fire protection and the purchase of fire apparatus. April 1922 – Frostburg accepts bid for a 1922 Ahrens-Fox, RK, 4-Piston fire engine with a 750 GPM pump and 60 gallon tank costing $11,600. The truck is delivered on May 23rd. This is the first Pumper purchased for the FFD, and is still used by the Department for parades and funeral details. It is housed at Price Station. 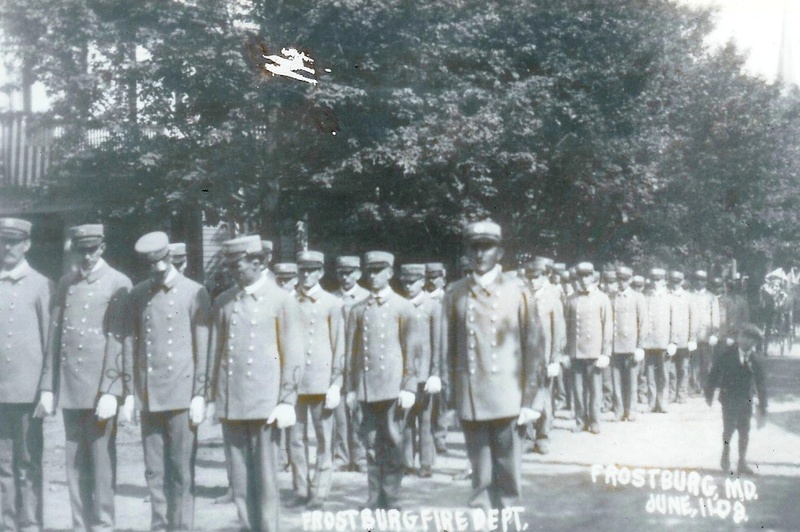 June 1922 – Frostburg Fire Department hosts the 30th Maryland State Firemen’s Association Convention. 1924 – During a special ceremony, William Wink and T.S. Preston, the last two surviving Charter members , lay the cornerstone for the new three story Central Fire Headquarters; later, known as Station 1. This building replaces the three hose-reel houses and the Municipal Building station next door, which became a police station and later the headquarters for the local ambulance service. 1926 – Jack Hart serves as the President of the Allegany County Volunteer Firemen’s Association. 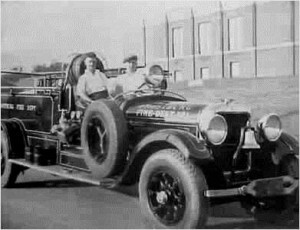 1926 – The FFD purchases its second motorized Pumper. 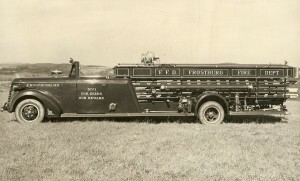 A Studebaker-Prospect Triple Combination Pumper with a large booster tank to handle rural calls. 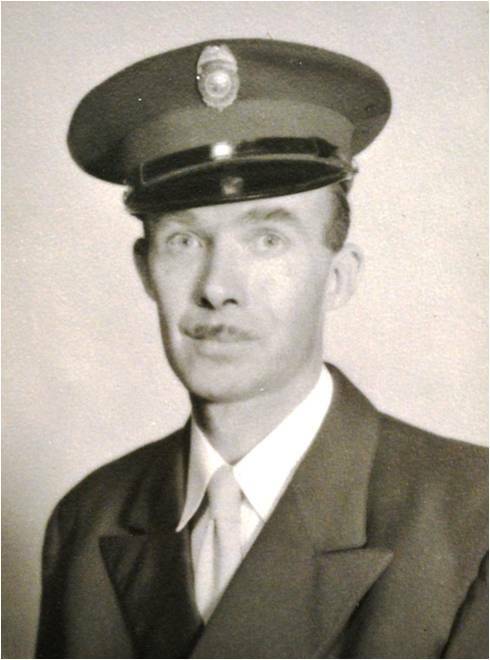 1928 – Alvin H. Rankin serves as the President of the Allegany County Volunteer Firemen’s Association. August 1930 – The Allegany County Volunteer Firemen’s Association combines with Garrett County, becoming the Allegany-Garrett Counties Volunteer Firemen’s Association. 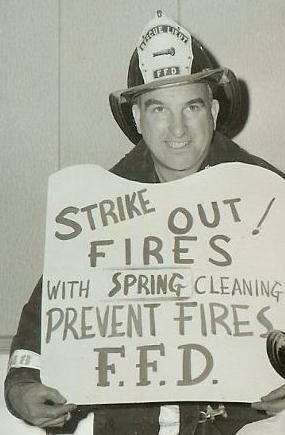 1932 – Elmer Kight serves as the President of the Allegany-Garrett Counties Volunteer Firemen’s Association. June 1932 – Frostburg Fire Department hosts the 40th Maryland State Firemen’s Association Convention. November 20, 1936 – The four-story Frostburg Opera House at the corner of Main and Depot Streets is destroyed by an intense fire and burns to a shell. Said to have been a spectacular fire, fed by grain stored in the basement and huge virgin white pine girders, melts the copper roof providing a fireworks-like display lasting most of the night. Lemmert Bros. Garage and four homes are damaged by flying embers. Estimated losses are $70,000 and the cause of the fire, though never proven, was thought to be arson. 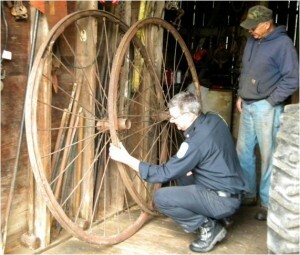 1938 – The FFD donates the Bowery Street Hose reel to the newly formed Shaft-Borden Volunteer Fire Company. 1940 – American LaFrance delivers a big 500-Series 500 GPM / 500 gallon combination ladder-pumper and hose carrier known as a “Quad” truck. 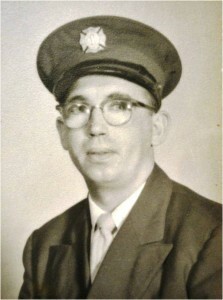 June 1942 – Frostburg Fire Department hosts the 50th Maryland State Firemen’s Association Convention. October 20, 1946 – A memorial plaque in memory of deceased FFD members is installed on Station 1 and a dedication is held. 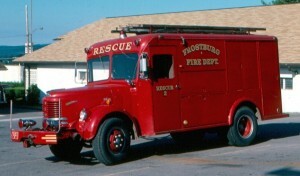 June 1947 – Frostburg hosts the 55th Maryland State Firemen’s Convention. During the convention, the Frostburg Fire Department presents our 1903 hand-drawn American LaFrance hook and ladder truck to the Maryland State Firemen’s Association (MSFA) as a gift. The old horse-drawn truck was last used by Frostburg on a fire ground in 1926. Recent 2013 inquiries to the MSFA as to the present location of this truck have yielded no answers. 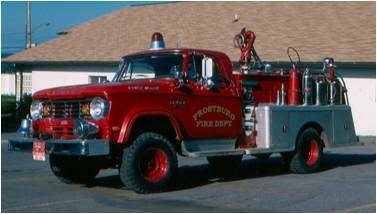 1949 – The Department purchases an Ahrens Fox EC, 750GPM Hale pump and a 300 gallon tank Pumper, which replaces the ’26 Studebaker-Prospect. December 25, 1949 – Frostburg is one of seven fire departments summoned to battle a disastrous Christmas night fire in Hyndman, PA. The fire guts several business buildings and homes in which one woman perishes and two firemen are injured. Twenty-eight families are left homeless. August 27, 1950 – The Department holds our first annual Crab Feast at the old YMI Park. Woody Layman severs as the Chairman with Ira Langluttig and John Sleeman on the committee. The idea for the Crab feast is to raise money for parade prizes for the annual Halloween parade. This first feast is so successful that the following year, the Arion Band was voted into the fund raiser. 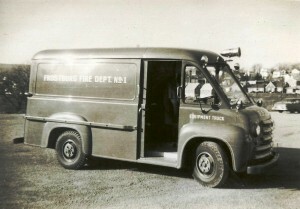 1954 – The FFD purchases its first Equipment Truck, a 1953 Dodge step van. 1957 – Paul Haberlein serves as the President of the Allegany-Garrett Counties Volunteer Firemen’s Association. October 1957 – State Fire Commissioner in Baltimore announce that FFD member Jesse Jacobs (right) is appointed as Deputy State Fire Marshall for the Western MD counties. 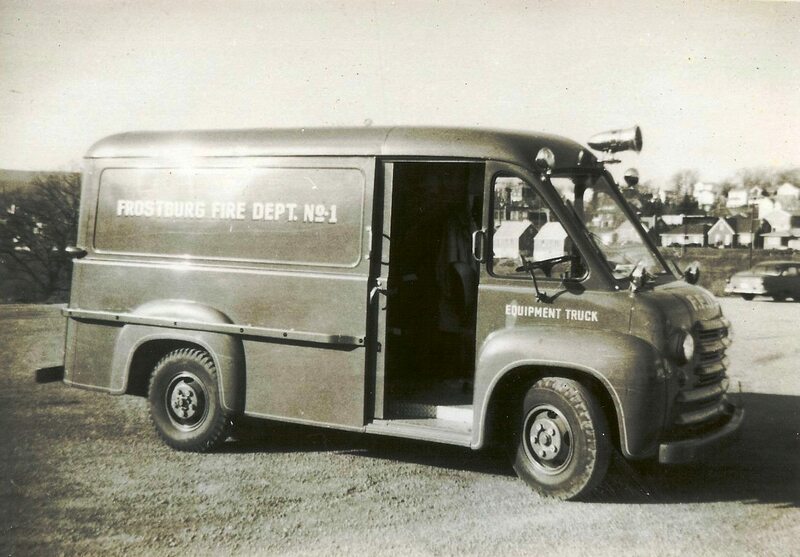 1958 – Sees the arrival of a Brumbaugh-Dodge Equipment & Rescue Truck, which has a 350 GPM pump and 200 gallons of water. It is fully equipped with f iremen’s bunker gear, search & rescue equipment, fire ground salvage and overhaul equipment as well as specialized tools for vehicle accidents. It replaces the ’53 Dodge step van. 1958 – Chief Joseph R. Durst (right) is voted Fireman of the Year by the Allegany-Garrett Counties Volunteer Firemen’s Association. 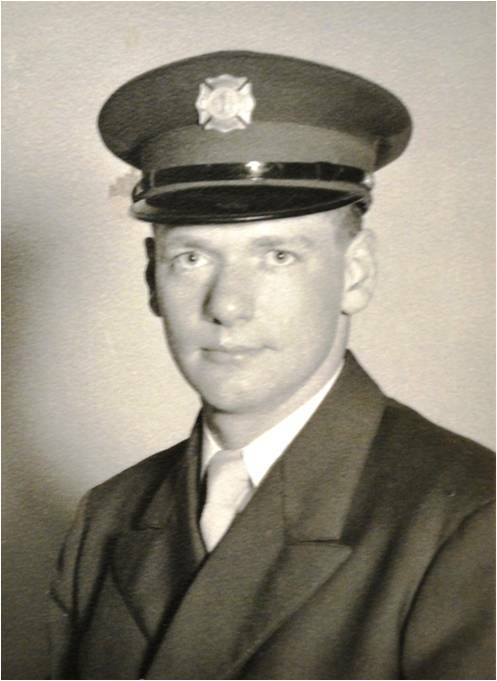 1961 – David Powell ser ves as the President of the Allegany-Garrett Counties Volunteer Firemen’s Association. 1961 – William Vogtman (left) voted Fireman of the Year by the Allegany-Garrett Counties Firemen’s Association. 1961 – Seagrave Fire Apparatus, Columbus, OH delivers a Custom, Class A, KB-Series 1000 GPM / 300 gallon Pumper costing $32,000. 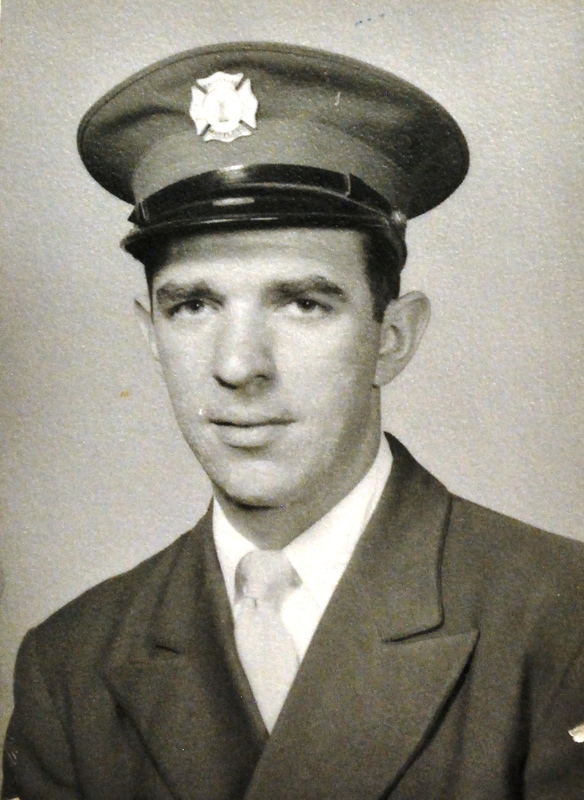 December 1962 – FFD firemen James M. McMorran (below left) receives a “Heroism Award” from Allegany-Garrett Counties Volunteer Firemen’s Association, where he is cited for bravery for his actions in connection with a trailer fire in Frostburg on May 31st of the previous year. After driving Engine 1 (right) to the scene he was informed that several children were trapped. In an effort to eliminate further delay, he entered the flaming structure without protective clothing, breathing apparatus or hose line and immediately initiated rescue attempts. As a result, both children were rescued by McMorran and former Barton Hose Com pany Fire Chief, Jim Lamberson. Unfortunately, Lamberson died at the scene as a result of a heart attack, after extreme physical exertion in helping with the rescue. The children were rushed by car to Miners hospital where mouth-to-mouth resuscitation was performed by McMorran, however both children later succumbed to their injuries suffering from severe burns resulting from inhaling super-heated air. July 1964 – Due to the growing town and the expansion of Frostburg State College, the Department purchases a used 1941 65’ Mid-Mount Aerial ladder truck from the Glouster City, NJ FD. 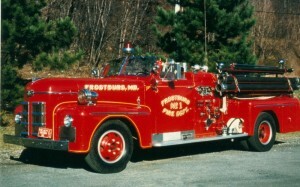 October 30, 1966 – Frostburg Fire Department’s Station 2 is completed and a formal Dedication Ceremony is held. The new station is located at 298 East Main Street. 1965 & ’66 – FFD firemen William T. Preston (below left) receives the “Fire Prevention” Award from Allegany-Garrett Counties Volunteer Firemen’s Association. 1967 – FFD firemen Jack Starkey (right) receives the “Fire Prevention” Award from Allegany-Garrett Counties Volunteer Firemen’s Association. 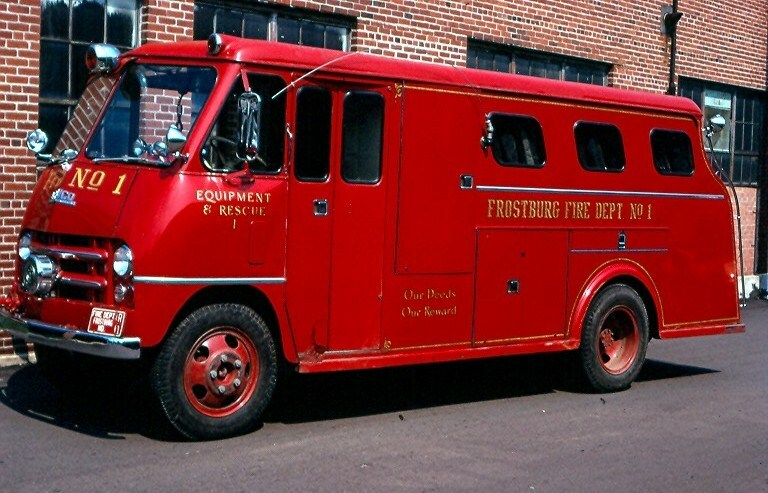 April 1967 – The FFD fleet grows with the purchase of an ex-Civil Defense REO Rescue Truck, which is designated as Rescue 2 and housed at Station 2. Also purchased in ’67 is a Dodge-Bruco 4×4 Power Wag on. This Engine is designed for use as an attack “Blit z-Wagon” and for use on brush calls. It has a 350 GPM pump and 250 gallons of water, designated as Engine 4 and also housed at Station 2. Later this year, the ‘40 ALF Quad, is cut down and modified by a local welding shop and moved into “Reserve Engine” status. 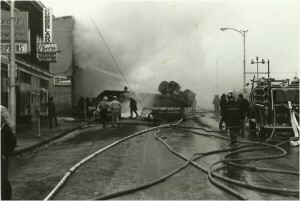 January 1969 – An extensive fire damages St. Michael Catholic School on Main Street. August 16, 1969 – Another blaze guts a three-story commercial building located directly across Main Street from St. Michael School. The fire spreads quickly through two buildings, destroying one business establishment and several apartments on the top two floors. Vizza Music City, along with all contents is destroyed. Family Billiards, next door in the same building sustains heavy smoke damage as well as the newly remodeled Diamond Restaurant and the Mary Carol Shop. Smoke is also reported to have spread through to the Fidelity Bank and some damage is anticipated from the activated sprinkler system. 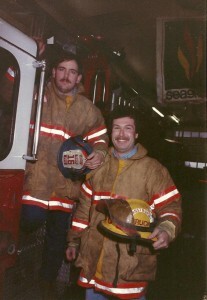 1970 – Donald Greig (right) serves as the President of the Allegany-Garrett Counties Volunteer Firemen’s Association. 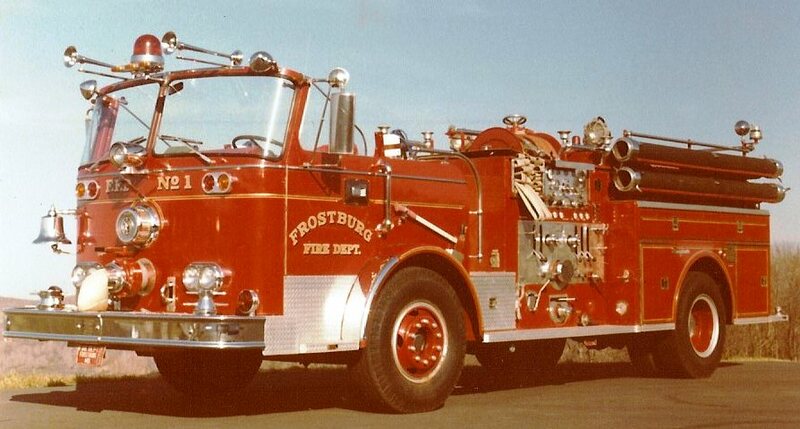 1971 – Frostburg Fire Department gains membership to the Cumberland Valley Volunteer Firemen’s Association (CVVFA) and was host for the Association’s 70th annual convention. January 1973 – One of the most spectacular fires in Frostburg’s history occurs when an early evening blaze starts in the Frostburg Bakery and spreads quickly throughout three adjacent structures completing gutting or severely damaging 8 local businesses. Firemen first on the scene are hampered gaining access to the Bakery due to a short circuit of a 220 volt transformer, which is arcing. The blaze apparently starts at a spot near the bakery ovens, although Fire Chief, John C. Durst and MD State Fire Marshall, Jesse Jacobs say, the blaze did not start in the ovens themselves. The fire is fed by lard and other flammable material as it spreads and there is some indication that the gas ovens also feed the fire. Flames reach over fifty feet in height during the three and one-half hours this fire burns out of control. Mutual Aid from nine other fire departments responded to the scene including the City of Cumberland who responds with their ladder truck. By 7:00pm all three floors of the bakery are fully involved. Flames have spread through the west wall into Hohing’s Menswear and through the east wall to Super Shoes (formerly Wittig’s Bowling Alley). When firemen are able to concentrate hose lines on the rear of the Super Shoe building, water being directed into the mass of flames turned into steam almost before it entered the structure. The fire was declared under control shortly after 9:00pm. Three firemen suffered smoke inhalation related injuries and were transported to Frostburg Community Hospital. 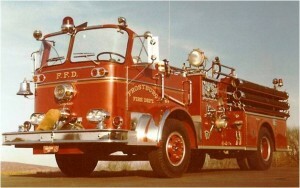 1973 – Seagrave delivers an open-cab diesel Pumper. This PB Series, 1,000 GPM/500 gallon rig replaces the 1940 ALF Quad. 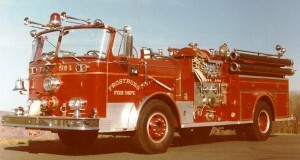 December 4, 1977 – The Frostburg Fire Department resigns from the Allegany-Garrett Counties Firemen’s Association due to strong differences of opinion concerning appropriation of county funds. 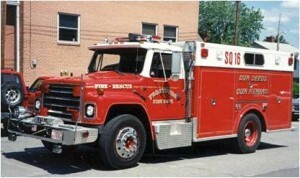 1977 – A 1960 Seagrave KB series engine (left) is purchased from Takoma Park, MD. The open-cab 1000 GPM/300 gallon Pumper is placed in service as Engine 3 and replaces the 1949 Ahrens Fox, which is sold to a collector. March 18, 1978 – Frostburg Fire Department conducts a special 6:00pm memorial at Station 1 where the department bell is rung 111 times in memory of our deceased brothers. At 7:30pm the annual department banquet is held for the 100th time at which time, letters from the National Fire Protection & Control Administration on behalf of the President of the United States and from Maryland’s acting Governor Blair Lee are presented. Au gust 1978 – The Frostburg Fire Department is celebrating our 100th birthday and getting ready to host the Cumberland Valley Volunteer Firemen’s Association (CVVFA) convention. A week prior to the convention, while hanging bunting/banners on the Frostburg Community Center, Fire Chief, Joe Durst, falls 25 feet from a ladder. The convention goes on, complete with the parade but Joe passes away a week later; shortly after the close of the festivities. 1978 – Central alarm and “911” service is implemented in Allegany County. 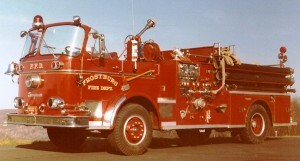 Frostburg is designated as Company 16 and all apparatus is re-numbered accordingly. 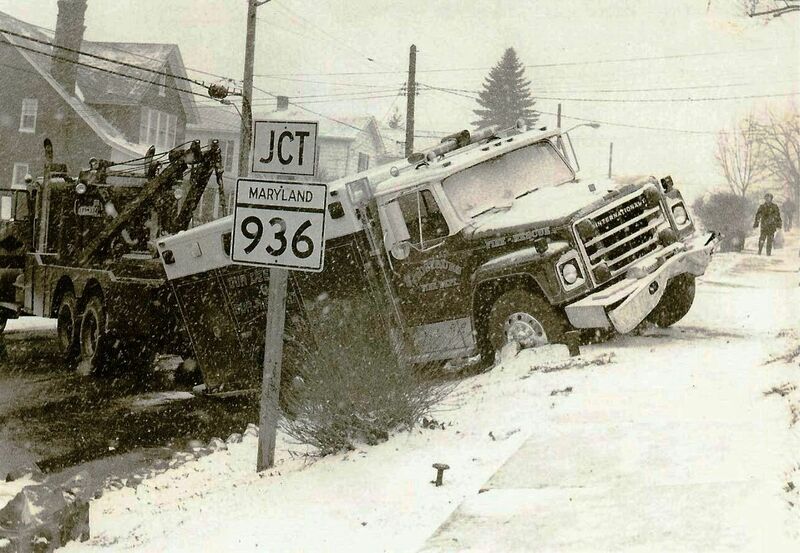 February 18, 1981 – Probably the greatest disaster to affect Frostburg happened when a tractor trailer loaded with lumber, ran away down the Big Savage Mountain on U.S. Route 40. The truck roared down Main Street at 80 mph, struck numerous vehicles, and then slammed into a large three-story commercial building at Main and Center streets. The violent crash resulted in three persons killed and nine injured. 23 fire companies from Allegany, Garrett, and Washington Counties responded in a huge mutual-aid effort to handle the casualties and battle the fire. The blaze resulted in several injured firemen, burned out of control for over two hours and completely destroyed the involve d structures. 1981 – Seagrave Fire Apparatus delivered a 100 foot rear mount aerial truck, which replaced the 1941 65 foot Seagrave. The $165,000 cost of this new truck was funded primarily by a grant in Frostburg State College’s budget for the protection of the college’s new high-rise dormitories. 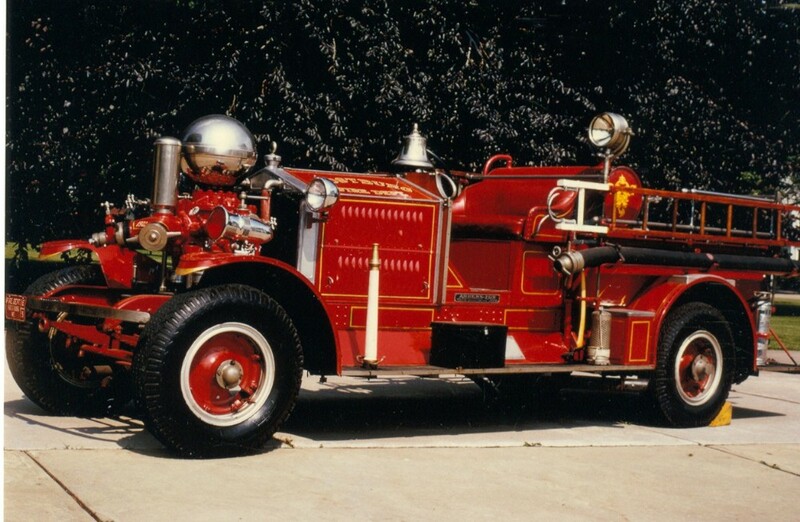 1982 – The 1961 Seagrave KB engine was repainted and repowered with a Detroit diesel engine and the 1953 Rio rescue truck was retired and retrofitted as a mobile-radio truck for the mountain amateur radio club. 1986 – An International-Marion 14 foot rescue truck was purchased at a cost of $95,000. 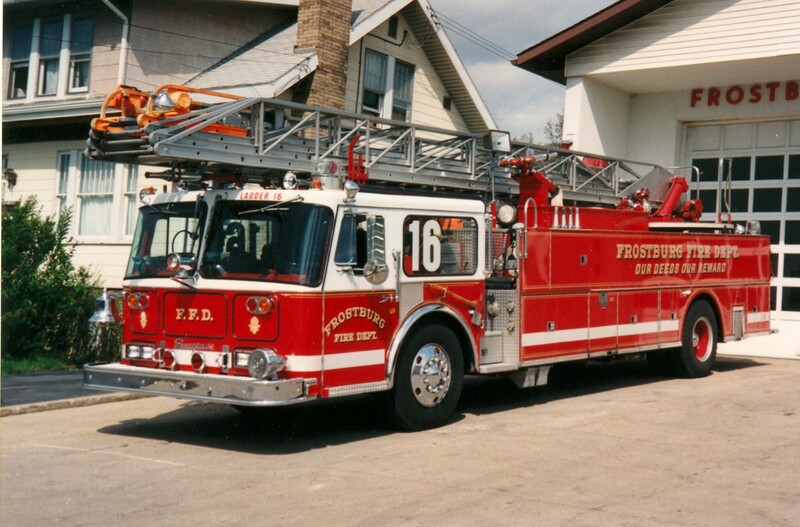 This new rig was the first FFD unit to wear a new paint scheme of white-over-read. It replaces the 1958 Dodge-Bruco truck that had been in service for 30+ years. The Dodge-Bruco was donated to the newly formed Rawlings Volunteer Fire Company. 1987 – The 1967 Dodge-Bruco “Blitz-Wagon” (E16-14) is re-bodied with a utility-style brush body and re-designated as Brush 16-60. December 1987 – The Frostburg Fire Department’s most serious apparatus mishap occurs when the Rescue Squad strikes a stone wall on Main Street after a motorist runs a stop sign and pulls in its path. Three of the four firefighters are transported to the hospital with minor injuries and the unit suffers $40,000 in damages. It remains out of service for three months while repairs are made. 1988 – The Department takes delivery of a new Seagrave JB Series 1250 GPM/500 Gallon Pumper costing $185,000, which replaces the x-Takoma Park ‘60 Seagrave Pumper and becomes E16-14. 1990 – This decade will present the FFD with new challenges such as ever increasing EMS support calls, the first female member and incorporating new recruits from FSU. 1991 – Lt. Ken (Kip) DeVault and Firefighter Bill (Buzz) Davis were credited with a “Life Save” when they entered a fully involved structure fire and pulled to safety FSU student, David Pear, who was severely injured but eventually made a full recovery. 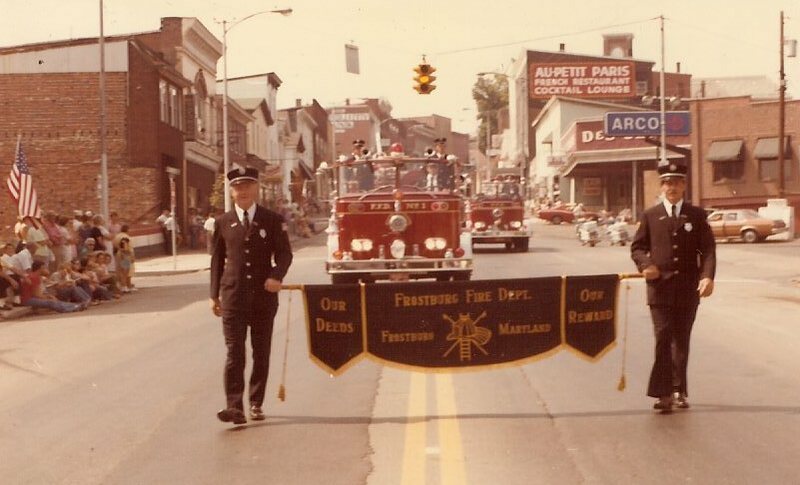 1992 – The FFD participates in the 100th anniversary of the Maryland State Firemen’s Association (MSFA) convention, which is held in Frederick Maryland. 1996 – The Department takes delivery of a new HME/4-Guys, 1500 GPM 750/40 gallon water/foam engine, which is designated E16-12. It replaces both the 1961 and 1973 Seagrave engines. The ‘61 Seagrave is purchased by FFD member Enoch “Junie” Price and the ‘73 engine is sold to Confluence, PA.
July 1996 – FFD’s Station 1 suffers a lightning strike which results in much radio equipment and wiring damage throughout the building. August 20, 19 96 – A fire begins in the kitchen of the Legends Restaurant (former Al’s Restaurant & Motel), 147 East Main Street and quickly spreads through the attached motel and to several buildings eastward along Main Street. Over 20 fire companies fight the blaze including Tower Ladders from Cumberland and LaVale and Frostburg’s Rear Mount Ladder. After three hours, the fire is brought under control but one building is destroyed and two severely damaged. This is the town’s worst fire since 1981. 1997 – The Department purchases a Ford F-350 4×4 pickup truck and is fitted out as a Utility/First Responder vehicle. 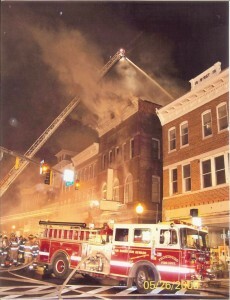 July 1997 – The former Frostburg Armory on South Water Street is struck by a fire, which causes $150,000 in damage to the Frostburg Public Works facility. June 2, 1998 – A rare F4 tornado touches down in the new housing developments on the north side of Frostburg causing much damage but no fatalities. FFD and mutual aid companies spend many hours on search and rescue and cleanup. 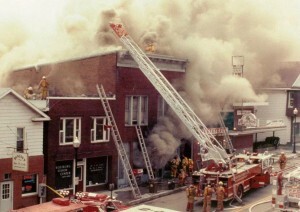 December 1999 – At the close of the 20th century, almost every block in Frostburg’s business section has been affected by fire resulting in a greatly changed Main Street skyline. September 11, 2001 – The Frostburg Fire Department mourns with the rest of the country as thousands of Americans lose their lives in the terrorist attacks on the World Trade Center in New York, NY, the Pentagon in Arlington, VA and a field not too far from Frostburg in Shanksville, PA. Included among those killed are 343 brother firemen from the FDNY. 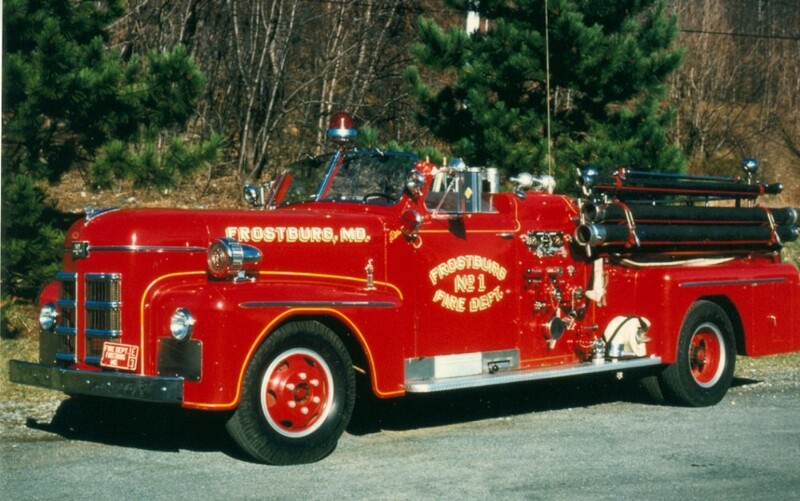 March 18, 2003 – The Frostburg Fire Department celebrates 125 years of service to the City of Frostburg and the surrounding communities. May 23, 2003 – Heavy fog conditions on Big Savage Mountain caused a massive 85 car chain reaction pile-up on Interstate 68 near Finzel that left two dead. 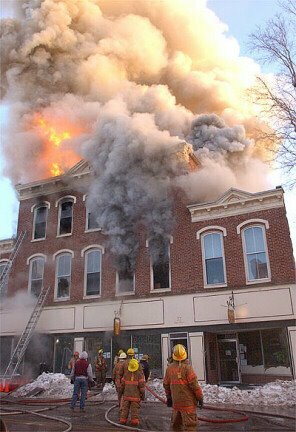 February 2004 – A fire at 16-24 East Main Street, the Lyric Building, began when radiant heat from a coal-fired boiler ignited. Severely damaged were Gandalf’s Restaurant and Bar and a clothing store. The fire occurs 130 years to the day when that same building burned to a shell and was torn down. 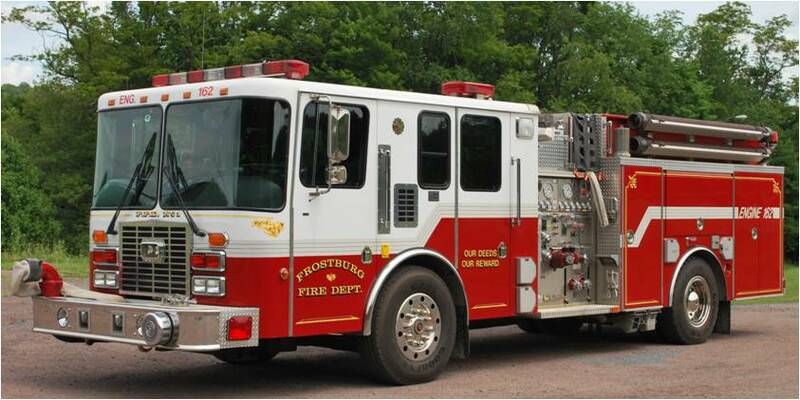 2004 – The Department takes delivery of a new Pierce Velocity, 105’ Rear Mount Aerial ladder truck. 2009 – The third major fire within a one-block area of the city’s business district in the last five years destroyed 1 W. Main Street, knocking Gianni’s Pizza Shop (Former Prichard’s Hardware) out of business and damaging the adjoining Crestmont Gentlemen’s Apparel Store. 2010 – Pierce Manufacturing delivers a new Velocity, Heavy Rescue Squad. The Rescue is designated as Squad 16 and replaces the 1986 International/Marion. December 2010 – Two Frostburg State University students were killed in an early-morning apartment fire on Main Street, when they were trapped in a second-floor rear apartment of a two-story building that housed Malino’s Pizza. The apartment only had one way out, which was blocked by heavy fire. January 2011 – The Department purchases a building located at 75 South Water Street. The building is the former operations warehouse for Price Distributing and after renovations, will replace the aging Station 1 as Headquarters. May 2012 – The FFD joins the world of “Social Media” by creating a Facebook page. June 21, 2012 – After 88 years responding out of Station 1, the bell is removed from the belfry and the firehouse, officially closed. Members from several different generations are on hand to witness the rigs pulling out of the station for the final time and the door being locked. 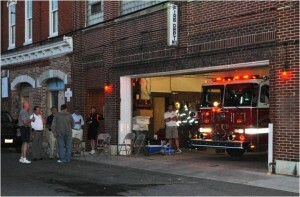 July 14, 2012 – After extensive renovations, the FFD moves into the new firehouse located at 75 South Water Street, which is officially designated as “Frostburg Fire Department – Price Station.” Only the apparatus bays and a few offices are part of “Phase 1” construction. 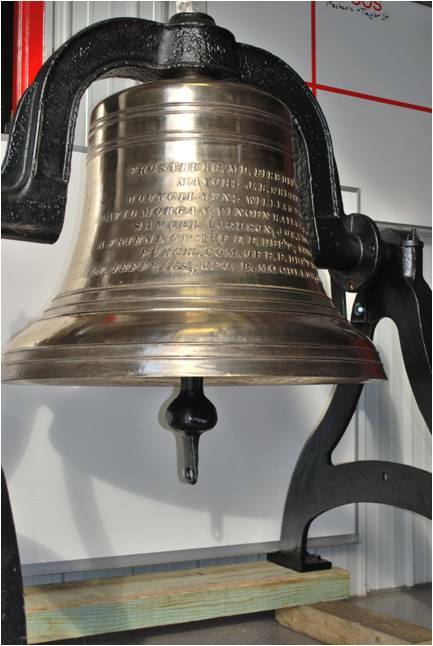 July 2013 – After being in storage for a year, the bell which was removed from Station 1 in 2012 is sent back to the original manufacturer, McShane Bell Foundry, for a complete restoration. The bell was returned to its glory and is on display at Price Station. 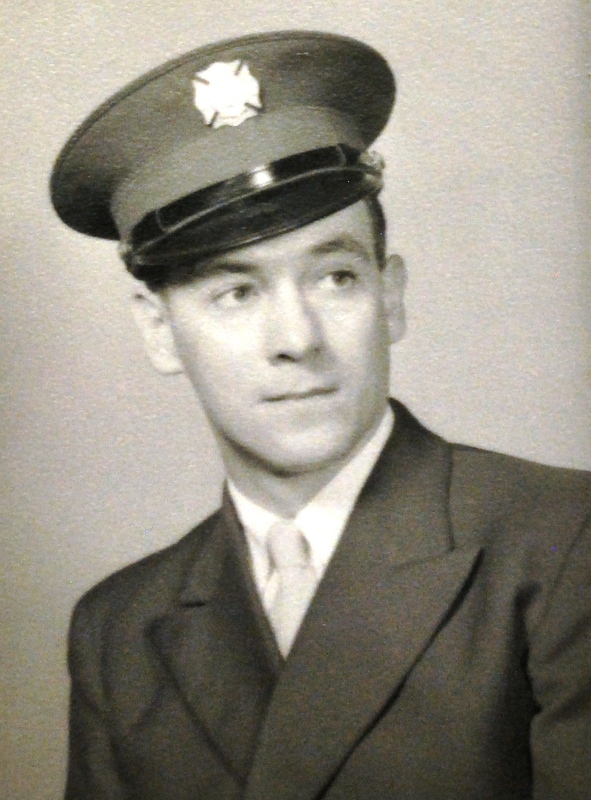 All associated costs were covered by the Dugan family. 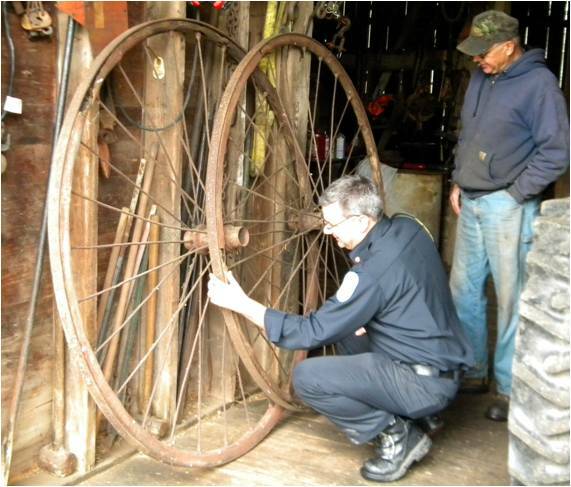 July 2013 – One of the FFD’s original Hose Reels was discovered in a Pennsylvania barn. 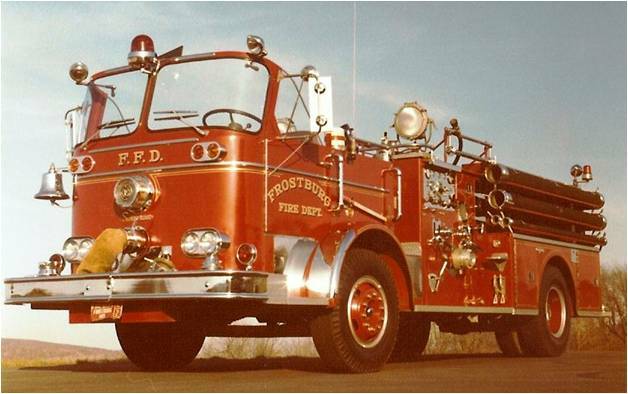 The owner is paying to have it fully restored and is anticipating a return to the FFD in the summer of 2015. August 2013 – The former Price residence, next to the firehouse, is converted into living quarters to house five FSU students for the new “Live-In” program. September 2013 – Continued smaller phases of the Price Station renovation are completed to include Administrative Offices and a Day Room/Lounge. 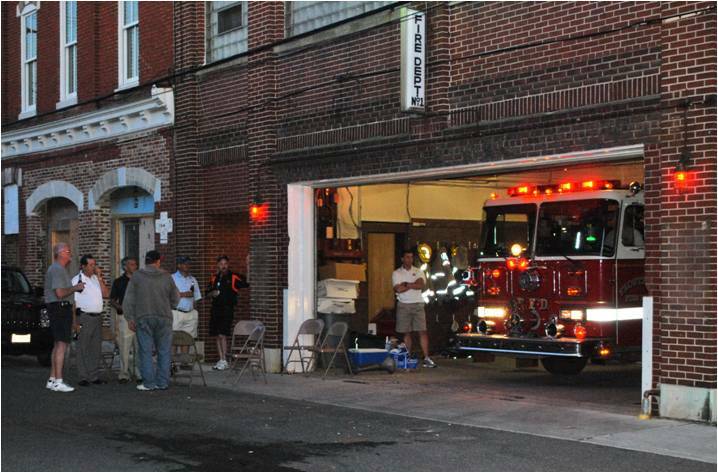 October 2013 – As the Department looks forward to closing out its 135th year of service, they are anticipating the need to replace the ’88 Seagrave Pumper (E164) and continued renovations to Price Station. October 2018 – After nearly four years of research and designed, the FFD Apparatus Selection Committee (ASC) made a recommendation to purchase a Pierce 6-Man Cab, City-Style Pumper, which the membership passed unanimously. The new rig is expected to be put in service in July 2019. Dedicated to all our brothers before us; especially the 153 whose names adorn the bronze plaques on the front of Price Station. A special thanks to FFD members; Bobby Dugan, Doug Hanson, Chuck Race, Harry Foor, Wes Foor, Gary Tummino, Jim Riviere & Matt McMorran. ARTICLE & PHOTO SOURCES: FFD Minute Books, Frostburg Mining Journal, Cumberland Times-News, Allegany Gazette, Heritage Weekly, Maryland Fire Dispatch, 1962 Frostburg Sesquicentennial History Program, 1978 FFD 100th Anniversary Program, Frostburg Museum, Warren Jenkins, Bob Lemmert, Steve Colby, Phil Beeman, Tim Wilson and Steve Bittner.